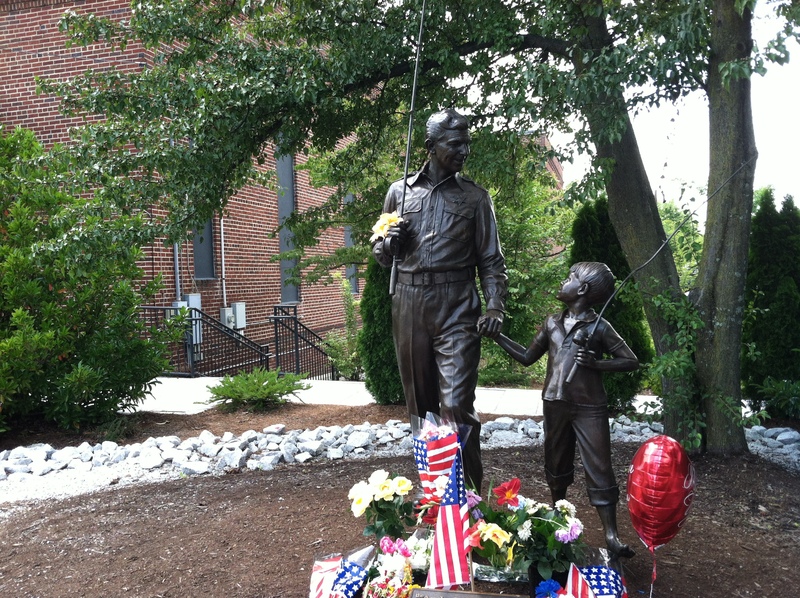 When our beloved “Mayberry Creator” passed away on July 3rd, 2012 the Mayberry Community reacted in kind by paying tribute after tribute on the web. Facebook absolutely exploded, as did other social networks. Soon afterward, many articles began to surface detailing Andy’s life, contributions and legacy. It’s amazing when you stop and think about how many people Andy’s life touched. I decided to collect every article I could find and share them in this post for all to read at leisure. These are wonderful. I hope you enjoy them. Is the ideal of small-town America a myth? The Autumn Leaves Festival is an event sponsored by the Greater Mount Airy Chamber of Commerce to celebrate our cultural music and craft heritage. This is the 43rd Annual year of the Autumn Leaves Festival and it will be held on October 9-11, 2009. This event is one of the longest running in-and most successful-events in the state. The Autumn Leaves Festival is always the second full weekend in October. We will host well over 170 craft booths and 25 food booths. WPAQ, the local AM radio station and recognized as the “grandaddy” of Old Tyme music will coordinate and host the bandstand on Independance Blvd. Nearly 200,000 people will frequent the streets of Mount Airy over the three day period. There are a number of parking lots in the downtown area that are well marked for the festival. The festival showcases our rich musical heritage, such as Old-Time, Blue Grass and Gospel performed by local musicians on the downtown stage. The unique arts & crafts of more than 170 juried craftsmen line the streets with many demonstrating their talents and skills passed down through the generations; then there is “Food for the Soul”, ham biscuits, collards & cornbread, barbeque, hamburgers, ground steak and more served with hospitality by our local civic and service organizations. It’s a walker’s paradise with visual delights and mouthwatering treats at every stop. It’s a toe-tapping, foot stomping, hand clapping kind of weekend where old friendships are renewed and new friendships are made. The Autumn Leaves Festival is a homecoming where guests become neighbors. For more information, please visit: http://www.autumnleavesfestival.com! This new age of connectedness never ceases to amaze me. Dr. Steve Lindsley and I connected over Facebook when I noticed that he & I were into the same things, except he’s a preacher and I’m just a drummer in a praise band. Ha! Long story short, Steve and I scheduled a time to meet over coffee in Mount Airy at the Good Life Cafe’. As expected, Steve and I got along famously and we’re looking forward to more meetings and spirited conversation. Steve’s a fascinating guy. Enjoy his thoughts on what it’s like being a “Mayberry Preacher” and be sure to check out all his links. Thank you, brother Steve! Huh. This is news to me, you see, because I actually do minister in Mayberry. Every day. So I did the only thing I could when I first found it – I called the number on the ad and explained to the poor soul who answered the phone how, since March 2003, I’d ministered with the fine folks of First Presbyterian Church of Mount Airy, NC, hometown of Andy Griffith and the inspiration for his Mayberry creation. There was an uncomfortable silence on the other end of the line. Apparently he didn’t quite get it. And I can’t blame him, really. The whole Mayberry thing can be elusive. Life as we know it today it is too complex, too technicolor for a classic 50’s sitcom. So how does one minister in Mayberry anyway – when every problem is solved in half an hour and the closest you come to a community crisis is Andy having to summon his marriage counseling skills or an inebriated Otis wandering the streets? In all truth, ministering in Mayberry doesn’t look and feel much different from ministering in any of the other tens of thousands of small American towns out there. Mount Airy exhibits all the classic signs of life in the 21st century. We’ve got a movie theater with stadium seats, free wifi around town (lots of hot spots, actually), a Chili’s restaurant, great coffee shops, a Rotary Club (of which I’m a member), a solid school system, a community college. These may not seem like such a big deal for the big city folk, but for a town of 10,000 it’s pretty nifty. So ministering in Mayberry has meant negotiating this dual identity with integrity and faithfulness, which I try to capture in my sermons every week.. And the thing is, it’s an absolute joy. It may sound hokey but it’s true: people are relatively at ease here, more willing to adopt a simpler way of life. You stroll Main Street on a sunny day and folks wave and smile at you, even (and especially) if they have no clue who you are. You stop in for a cup of coffee at the Good Life Cafe and almost always see someone you know – and if you don’t yet know someone, you probably will soon. And it carries over to Sunday mornings, especially in the comments I hear from visitors who remark how warm and friendly the church was; how people greeted them with a smile and handshake and invited them back. Believe me, this isn’t something a pastor can coach our flocks to do. We can’t make this sort of thing happen. It’s just who these people are. Which is pretty much what I told the seminary guy who made that magazine ad. I told him that Mayberry exists wherever people enjoy life, wherever folks live simply, wherever they follow the time-old Biblical mantra: do unto others as you would have them do unto you. It can be in a big city with skyscrapers reaching to the heavens, or a small town of 10,000 where most everyone knows your name. Although I must admit to being quite partial to the small town myself. Especially when it’s Mount Airy you’re talking about. The search may go on elsewhere, but this place will always be Mayberry to me. Dr. Steve Lindsley is author of The Mayberry Preacher, a blog of his weekly sermons as pastor/head of staff at First Presbyterian Church of Mount Airy. He’s also a singer/songwriter performing regularly, instructor at Surry Community College, and author of the blog Thoughts and Musings on Faith, Music, Family, Life. Most importantly he is husband to a wonderful wife, father to two young boys, and caretaker for four dogs and two cats.